If you want it to be a memorable time that no one will ever forget, do it rock star-style with Platinum Ride Limo. Their Party Packages roll out the red carpet – literally – for your party bus, wedding limousine, prom limousine, Quinceanera limousine or whatever celebration is deserving of a luxury limo. From children’s birthday parties to bachelorette parties, the possibilities are endless when it comes to making the most of a special occasion with friends and family. With every Party Package, your limo will be decked out in party beads and the chauffeur will roll out the red carpet when you get in and out of the vehicle. Adult Party Packages come with two bottles of champagne (though the Limobus comes with three), and for those under 21, two bottles of sparkling apple cider. Though there’s no eating in the limo, you’re welcome to bring all the extra refreshments you like, be it soda in your Quinceanera limo or beer in your party bus. Best of all, these Party Packages are free as long as you reserve your limo at least five hours in advance! You’re also welcome to upgrade your Adult Party Package in a Scottsdale limo rental to one with VIP privileges, including no cover charge or waiting to get into the hottest night spots in Old Town Scottsdale. Yet, your rock star ways do not end with your Party Package alone. The Limobus, 21-passenger Escalade and 20-passenger H2 Hummer all come with a 42-inch plasma TV, DVD and CD players, premium sound systems, karaoke, and neon-star fiber optics. The Escalade has a VIP room in the back, and both it and the H2 Hummer come with a Play Station 2. 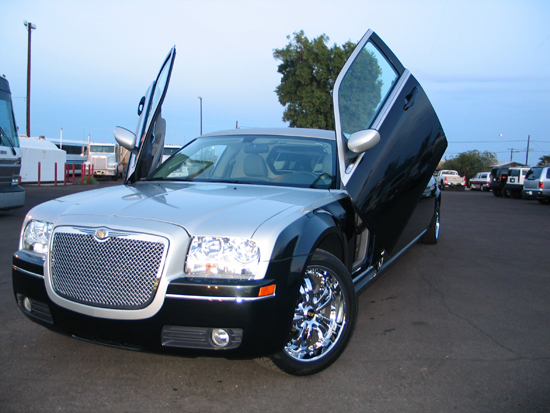 The 12-passenger Chrysler 300M has many of the same features, but with 20-inch chrome wheels, a Bentley grill and Lamborghini angel-wing doors. Then there’s the classic Lincoln Town Car with a flat screen, DVD and CD players, and bar area. Most importantly, there’s no need to worry about the driving. Your Platinum Ride Limo chauffeur is not only guaranteed to be fun and friendly, but also a responsible professional driver of your party bus, wedding, prom, or Quinceanera limo or whatever occasion inspired your stretch limo experience. Owners Joey and Frank DeVento make sure of that – Italian brothers whose commitment to helping you celebrate in rock-star style is second only to keeping you safe.